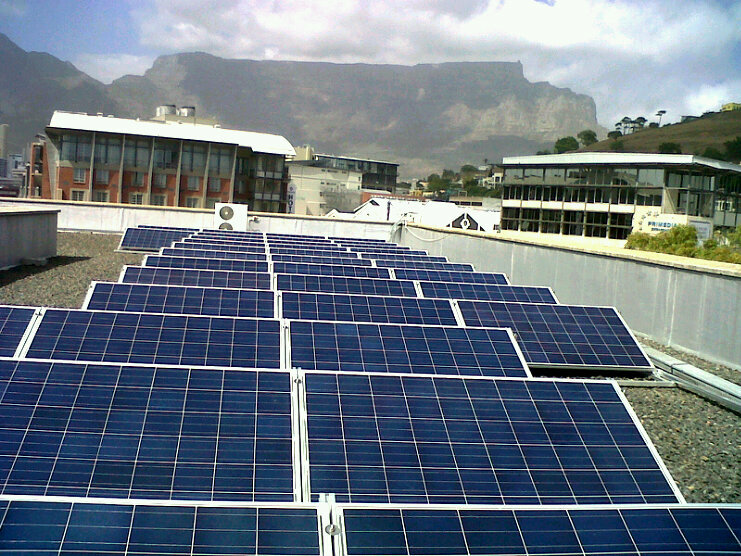 The City of Cape Town is in the process of implementing sustainable energy efficiency measures in some of its public buildings. The first of these is the Gallows Hill Traffic Department building, which has implemented smart metering, rooftop PV systems and LED lighting. There have been clear benefits in electricity consumption reduction and interesting lessons have emerged. One of the objectives of City of Cape Town’s Energy and Climate Change Action Plan (ECAP) is to reduce energy consumption by 10% in City-owned facilities. Gallows Hill Traffic Department, situated in Green Point, is one of 90 large administrative City-owned buildings. It is very visible and has a large public interface, and was therefore selected as an ideal building to implement and showcase the renewable and energy efficiency (EE) interventions to the public. Gallows Hill is one of the first City buildings to receive three of the most energy efficient interventions: a solar photovoltaic (PV) system; a smart meter; and LED lighting technology with occupancy sensors. The PV system is funded by the City, while the energy efficient lighting and smart metering projects are funded by the Division of Revenue Act (DoRA) through the Energy Efficiency Demand Side Management (EEDSM) programme. The Energy and Climate Change Unit of the Environmental Resource Management Department has implemented the interventions in a three phase approach. In the realms of energy management there is a saying: “If you can’t measure it, you can’t manage it”; therefore the City has implemented a phased city-wide project to install smart Advanced Meter Readers (AMRs) into City operations and facilities to record, measure and monitor consumption of electricity continuously over time. Gallows Hill’s electricity consumption is being monitored through the City’s online metering system, so data can be accessed at any point in time. The historical data is stored and the amount of electricity consumed can be monitored before and after interventions have been implemented. In this way, the true savings of the interventions can be calculated. To date, there have been savings of 3% from EE/behaviour change since the retrofits, with greater savings expected when the next interventions are installed. In March 2014, the City designed and installed a 10kWp solar system on the roof of the building, which consists of 42 photovoltaic panels which together generate a maximum of 10kWp of renewable energy, which will feed directly into the building and complement the network capacity fed by the City’s electricity grid. When connected, the annual generation is estimated to be 16 624kwh, allowing the building to provide 33% of its energy from rooftop PV. The third intervention to be implemented throughout the building, during the 2014/15 financial year, is a completed energy efficient lighting retrofit which will replace all the existing lighting in the building with light emitting diodes (LEDs). LED lights use up to 10 times less power and last 25 times longer than inefficient incandescent bulbs. A further intervention, related to behavioural change, which is rolled out in City buildings is the Smart Living workshop and campaign series. This campaign aims to create awareness around resource conservation and provides information and energy saving tips that can easily be implemented at home and in the workplace. The campaign is based on the Smart Living Handbook and showcases both low cost and high cost technologies and interventions that can be used to reduce energy, waste and water and to conserve and protect the environment. The Unit will also be inviting facility and building managers to participate in an accredited Fundamental Energy Management training course, where key technical methods of optimising energy savings will be showcased in practical teachings and assignments. Due to budget constraints it was decided to procure the system first and then undergo installation separately, which resulted in the cost of the entire system amounting to more than was budgeted for. Developing the Request for Quotes for the installation of the 10kWp PV project triggered Supply Chain Management to tread cautiously, as this was the first time PV had been installed and processes for this were not in place. The Unit was encouraged to use the FIDIC (International Federation of Consulting Engineers) form of contracting, which is a more complex form of contracting that involves construction and ensures that the project meets all health and safety laws. Other important lessons include the need for engagement with the Electricity Department to get clarity on guidelines for Small Scale Embedded Generation (SSEG) applications. It is also crucial to understand the IT Department’s needs and requirements to ensure that data can be obtained from the PV system installed. The main lessons learnt were in terms of capacity building – using FIDIC contracting for the first time, and developing a process in the supply chain management framework for contracting RE/PV systems. These are valuable lessons for future installations as well as for other municipalities and organisations to take heed of. For further information regarding this project contact Sumaya Mahomed on 021 487 2084 or sumaya.mahomed@capetown.gov.za.